While I'm waiting for my patterns to come back from the printer, I'd like to introduce you to another design, "Portraits of My Garden". 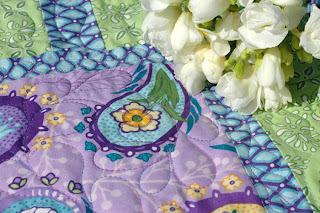 This quilt is really quick and fun to sew - probably the easiest of all the quilts in my line. 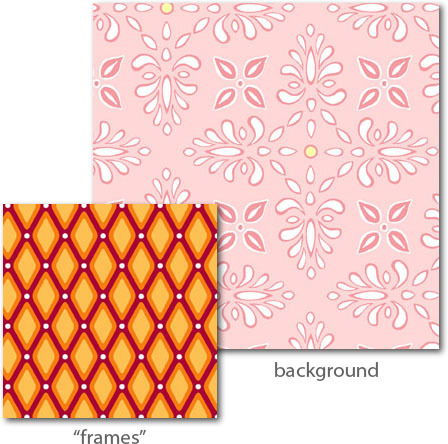 My goal was to design a piece that would showcase feature prints in large "framed" pieces, hence the name of the quilt. I also wanted to explore having a color, rather than white or cream, function as a neutral background. 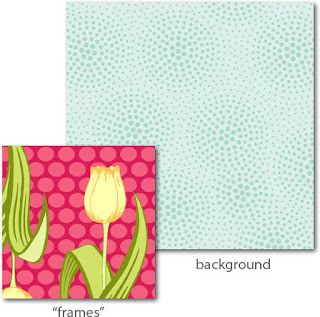 The large feature prints are showcased framed up as "portraits". 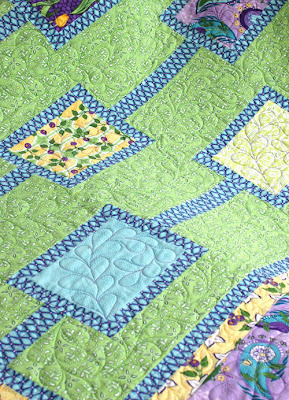 I love how Deborah Norris echoed the feathers she quilted down the center of the columns in each individual block. 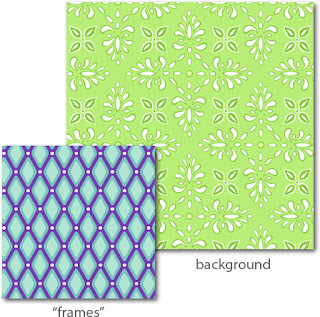 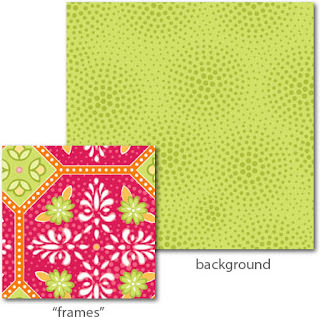 I chose the medium green creamware print for the background and the purple and aqua geometric diamonds for the "frames" in the sample. 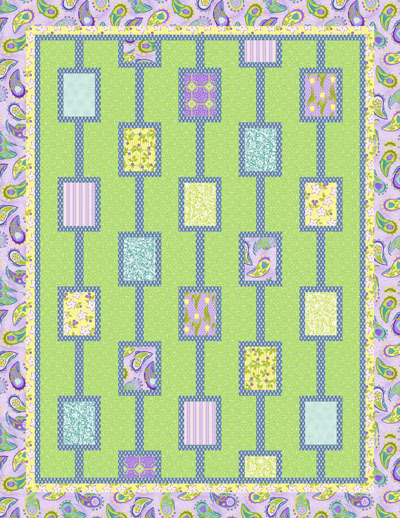 Again, Fat Quarter Shop will have this pattern in just a few weeks. If you are a shop owner, please contact me directly to arrange an order and/or to be listed as carrying the patterns. 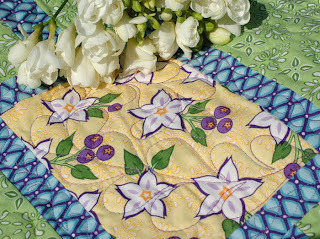 My friend Mary tested this pattern for me in Ambrosia. Take a peek! 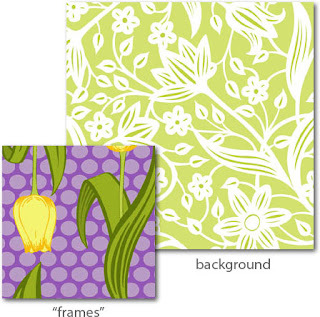 Love the framed units, they have potential for using for embroidery etc and you have tulips in your garden! I love tulips:) Mary did a lovely job of making up the quilt. 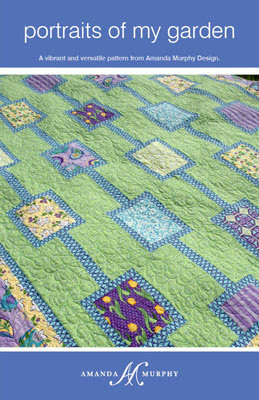 Love the quilt in Quiltmaker, aren't you a star?? 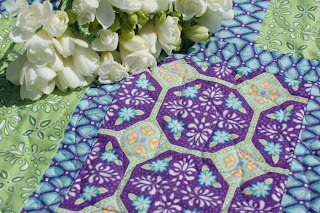 Love, love all your patterns and the fabric is just luscious!! Keep up the good work, I'm partial to my gal from Charlotte! 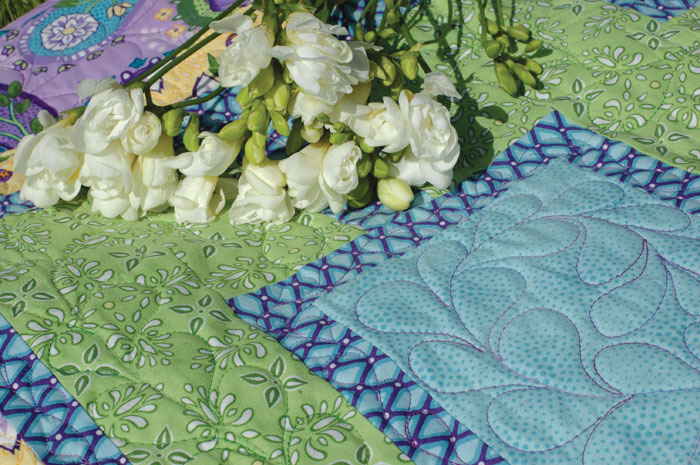 Quiltermaker's 100 Blocks Volume 3 Blog Tour!